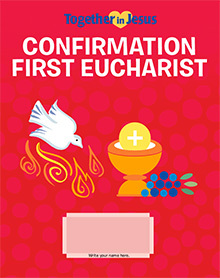 Together in Jesus Confirmation and First Eucharist program at St. Mary’s Basilica has been designed to fulfill the requirements put forth in the Diocese of Phoenix Sacrament of Confirmation and First Eucharist Policy and Guidelines 2009. By completing the above components of preparation your child will meet the criteria for readiness to receive Confirmation and First Eucharist. Please review the Confirmation and First Eucharist Program Requirments for 2018-2019 for detailed information on each component of preparation for Confirmation and First Eucharist. Every candidate should have a Confirmation sponsor. Candidates may have more than one sponsor, however only one should be designated as the liturgical sponsor who presents the candidate for Confirmation. 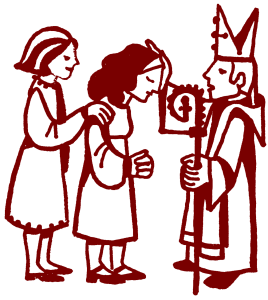 It is desirable that baptismal godparents, as extensions of the spiritual family, continue this role at Confirmation. Sponsors should be actively involved in the child’s life of faith before, during, and after Confirmation. Sponsors must be at least sixteen years old. They may not be the natural or adoptive parents of the Confirmation candidate. They must be fully initiated into the Catholic Faith (Baptism, Confirmation, Eucharist). They must be leading a life in harmony with the Faith. They must be free of any canonical impediment (RC 5-6; Canon 874, 892-893; CCC 1311; RCIA 10.2). An awareness of God’s unconditional love for them. Must have previously been prepared for and received the Sacrament of Reconciliation (ordinarily occurs in Second Grade). Consistent attendance at formation sessions. Must be capable of renewing their Baptismal promises. Participation in a Family Sacraments of Initiation Retreat. Willingness to participate in community service. By completing the six components of preparation your child will meet the criteria for readiness to receive Confirmation and First Eucharist. In addition, the Diocese of Phoenix also requires that children in Confirmation and First Eucharist preparation be involved in the parish’s on-going catechetical formation program (Children’s Ministry) held on Sunday mornings. However, to assist over-scheduled families we have integrated Confirmation and First Eucharist preparation into our Children’s Ministry program on Sundays to alleviate the need for families to participate on a separate night at St. Mary’s Basilica. Because of this accommodation, your child may only miss three Sunday classes and may only miss one First Reconciliation class. However, you will need to complete the missed reconciliation session’s assignment. and bring it to one of the above registration Sundays after all the Masses.